Manassas City Hall is located at 9027 Center Street, Manassas VA 20110; phone: 703-257-8200. Photo: Liberia, ca. 1825, 8601 Portner Avenue, Manassas, VA. Listed on the National Register of Historic Places in 1980. Photographed by user:Jerrye and Roy 2007, MD, 2010, (own work) [cc-by-3.0 (creativecommons.org/licenses/by/3.0)], via Wikimedia Commons, accessed January, 2014. Incorporated as a town in 1873, Manassas sprung from a vital, but war-torn, railroad junction to become the transportation, commercial, and governmental hub of Prince William County. After the establishment of the Orange and Alexandria Railroad and its connection with the Manassas Gap Railroad in the 1850s, the junction of the two railways proved a natural candidate for settlement. 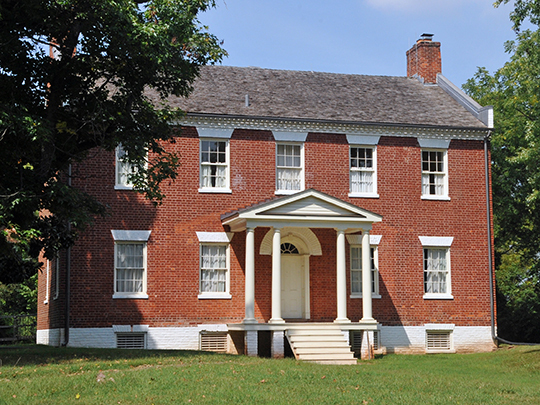 The location of both the county seat and railroad at Manassas stimulated the construction of many late 19th and early 20th-century notable homes for government and railway employees. The spectrum of styles exhibited by houses in the district from the Italianate, Second Empire, and Queen Anne to the Craftsman and American Foursquare demonstrates the rich variety in taste and life styles of Manassas' past residents. Figuring prominently in the construction of many buildings in the district were John, Frank, and Ira Cannon, native builders who built or designed several late 19th- and early 20th-century residences and churches in the district. Albert Speiden, a Manassas resident as well as a Washington, D.C. architect, designed or treated several structures in the historic district, ranging from commercial and residential structures to public buildings and churches. In addition, the nationally known Washington architect, Waddy B. Wood, designed a residence in the affluent Grant Avenue neighborhood of the district. The railroad continued to prove important to the town's growth throughout the first three decades of the 20th century. Whether importing manufactured goods, exporting dairy products, or transporting commuters to Washington, D.C., the train continually demonstrated its vital significance to Manassas and its continuing prosperity. David A. Edwards, Architectural Historian, Virginia Division of Historic Landmarks, Manassas Historic District, Manassas, Virginia, nomination document, 1988, National Park Service, National Register of Historic Places, Washington, D.C.